Engel or Yeti? This question disturbs everyone while choosing the best cooler. Actually whatever variant you choose, you will not lose, because the quality of these coolers doesn’t need proofs. Most likely your choice will be based on your own preferences and tastes. In this article we will try to help you make your choice and understand which one among two these GIANTS suits you more. Despite the fact that each of these coolers has its own pros and cons they both are at the top positions in the coolers world and it means that in any case you will be satisfied with the result. So, let’s start our battle, or rather comparison of these two giants. Yeti Coolers and Engel Coolers. Let’s Get Acquainted With Manufacturers. Everyone who even a bit understands coolers quality knows that both Yeti and Engel manufacturers are leading companies in the world market. Both these brands provide users with extremely long ice retention time and high durability level of their coolers. For additional information about prices of these coolers you can follow Engel Coolers and Yeti Coolers and check their prices on Amazon. 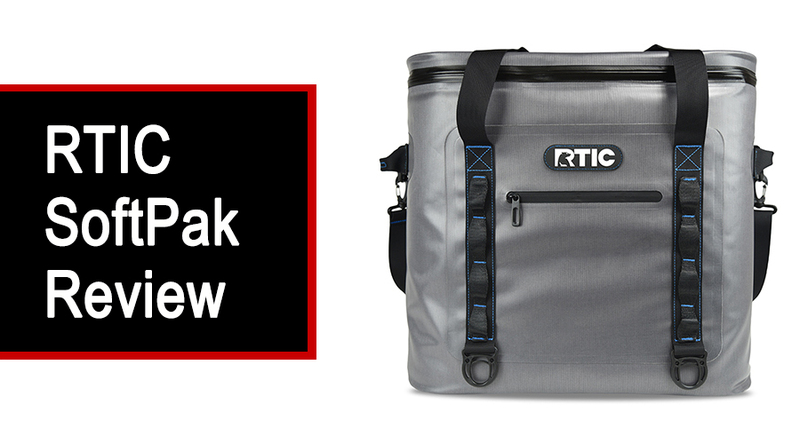 We will start our review from the Yeti coolers. Are you ready? Get acquainted with Yeti Coolers! You simply can’t miss this great coolers manufacture with its startling line of Yeti coolers while start your searching. When you are choosing among the coolers with outstanding characteristics, Yeti coolers will be one of the first options that you will see. The Yeti manufacturer can be called a coolers company that creates future. But let’s consider the first steps of creation of such a tremendous company. A little bit from history. The Seiders brothers were tired of coolers that couldn’t keep up with the individuals that depended on them, so they decided to create the perfect cooler for their needs. Yeti coolers have been created by the Seiders brothers who were fed up of different people preferences and decided to create a cooler primarily for themselves. With the process of time these coolers have conquered the users’ hearts and leading position in the market. It is no wonder, because such characteristics as permafrost insulation, rotationally molded construction and the state-of –art design with no-sweat features could not go unnoticed. With the wide range of capacity that starts from 20 cans to 222 cans users can choose the most appropriate size for their needs. If your heart is already conquered by these coolers but your brain requires more information you can go and check out Yeti on Amazon. Get acquainted with Engel Coolers! Engel has been in business for over 50 years, which means that you know you can depend on their product AND depend on their quality. Engel manufacturers have started their work more than half a century ago. What does it mean? Brand that is manufacturing coolers during such a long period has already proved its quality and become a reliable company with millions of satisfied users. 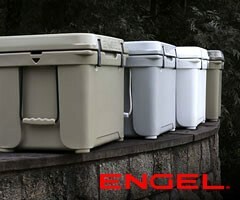 Engel lineup includes variants for hunting, fishing, hiking and even coolers for parties outdoors, so you are able to easily choose the model that will fit your needs. These coolers are created through a roto-molding procedure that ensures that every piece is cut and created with precision, providing only the best when it comes to ice retention and ability to keep contents colder for longer periods of time. You’ll find 2 inches of insulation in these coolers, as well as an airtight seal. 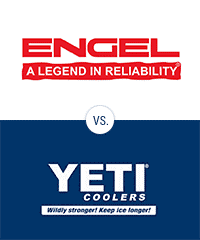 Engel coolers as well as Yeti coolers are created with using of rotationally molding technology which provides the highest level of durability and the longest duration of ice retention period. The walls of Engel coolers are made of two inches foam in order to create the maximum insulation and make cooler able to hold cold as long as it is possible. 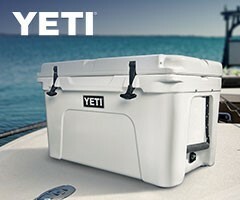 If after reading about Yeti coolers you think that they offer the widest range of coolers’ capacity, you are mistaken. Engel coolers are manufactured with the capacity from 24 cans to 441! cans. Can you imagine such difference in sizes? It is obvious that with such variety of sizes you will definitely pick up the necessary one for you. What kind of capacity do these coolers have? Well, in a wide range of sizes, you can find one that holds as little as 24 cans, and one nearly 20 times bigger that can hold up to 441. Engel coolers have achieved popularity not among travelers or people who like to use them at outdoors parties, but among such professional services as Fire Rescue personnel and Emergency Medical Services (EMS) too. Powerful 2X2 Air Pump and insulated cooler box. For more information about prices and characteristics follow the link and check Engel Cooler prices on Amazon. Yeti or Engel? Peculiarities of Each Brand. After reading a characteristic of each of these leading manufacturers it becomes clear that they are very similar. But in this paragraph we are going to find some peculiarities of Yeti and Engel brands. The thickness of the coolers’ lid and walls is two inches of the special foam for prolonging the duration of ice retention period. Coolers’ manufacturer offers five years warranty to users. Users’ reviews about the duration of ice retention periods completely coincide with the terms provided by Yeti manufacturer. People write that these coolers are able to hold an ice from five days to two weeks depending on the weather conditions. Engel coolers’ are also equipped with the two-inch walls, bottom and lid for the best insulation and long ice retention. Engel manufacturer provide users with three years warranty and offers ice retention term equal to ten days. Users write that these coolers are able to hold an ice even longer then during this period. Tundra 35 – Cooler’s measures of 14 x 10 x 9.5 inches. Capacity of the cooler is 20 cans. Full Yeti Tundra line up prices on Amazon here. ENG25 – Cooler’s measures of 14.5 x 9.25 x 9.25 inches. Capacity of the cooler is 24 cans. Full Engel DeepBlue line up prices on Amazon here. Yeti coolers are produced in blue, white or tan colors. But notice that not every size is available in these colors. Pay your attention on available colors when choosing your size. If you decided to choose cooler among Yeti line you can Check out the Yeti coolers on Amazon. The Engel coolers also can be found in different colors. You can choose among grey, white, camo or tan colors. As well as Yeti coolers not every size is available in all these colors, so keep this in mind. If you decided to purchase Engel cooler you can Get it here on Amazon. In this battle we give you an opportunity to choose a winner by yourself basing on all previous information. Good luck! 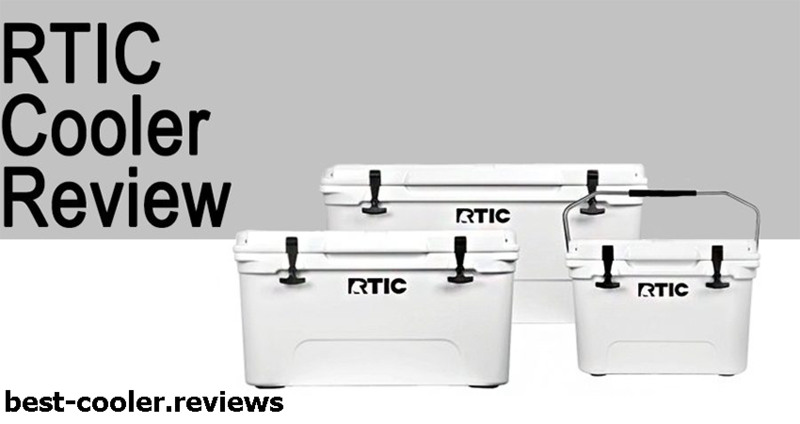 If something was unclear or you just want to read users’ reviews we recommend to check our buying guide here or to familiarize with Yeti coolers post. You can also find one more battle between two other giants: debate about Yeti versus Orca coolers.